BETTER PRODUCTION MMS FEBRUARY 2018 86 mmsonline.com ON-MACHINE ME ASUREMENT Scanning Probe Application on a Swiss-Type The 17 employees at Karlheinz Lehmann GmbH in Oberwolfach, Germany, focus on the manufac- ture of precision, rotationally symmetrical parts using equipment such as 20 CNC lathes and mill- ing machines. An example of one of these parts is a complex quick-coupling for compressed-air input for Parker Hannifin GmbH. This was a chal- lenging project, especially given the parallelism required for the part's four slots. 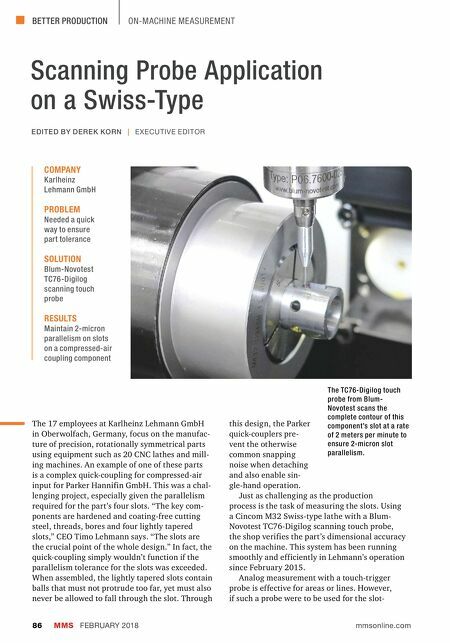 "The key com- ponents are hardened and coating-free cutting steel, threads, bores and four lightly tapered slots," CEO Timo Lehmann says. "The slots are the crucial point of the whole design." In fact, the quick-coupling simply wouldn't function if the parallelism tolerance for the slots was exceeded. When assembled, the lightly tapered slots contain balls that must not protrude too far, yet must also never be allowed to fall through the slot. Through COMPANY Karlheinz Lehmann GmbH PROBLEM Needed a quick way to ensure part tolerance SOLUTION Blum-Novotest TC76-Digilog scanning touch probe RESULTS Maintain 2-micron parallelism on slots on a compressed-air coupling component EDITED BY DEREK KORN | EXECUTIVE EDITOR this design, the Parker quick-couplers pre- vent the otherwise common snapping noise when detaching and also enable sin- gle-hand operation. Just as challenging as the production process is the task of measuring the slots. 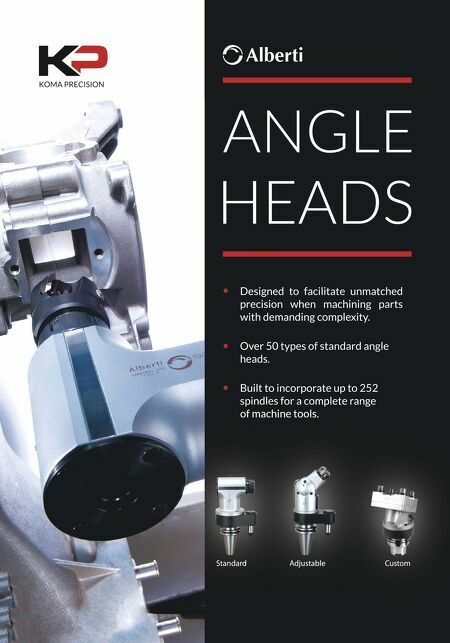 Using a Cincom M32 Swiss-type lathe with a Blum- Novotest TC76-Digilog scanning touch probe, the shop verifies the part's dimensional accuracy on the machine. This system has been running smoothly and efficiently in Lehmann's operation since February 2015. Analog measurement with a touch-trigger probe is effective for areas or lines. However, if such a probe were to be used for the slot- The TC76-Digilog touch probe from Blum- Novotest scans the complete contour of this component's slot at a rate of 2 meters per minute to ensure 2-micron slot parallelism.